explores depression from the perspective of those who are closest to the sufferers of this prevalent disorder--spouses, parents, children, and lovers--and gives the successful coping strategies of many people who live with a clinical depressive or manic-depressive and often suffer in silence, believing their own problems have no claim to attention.Depression fallout is the emotional toll on the depressive's family and close friends who are unaware of their own stressful reactions and needs. Sheffield outlines the five stages of depression fallout: confusion, self-doubt, demoralization, anger, and finally, the desire to escape. Many people will find relief in the knowledge that their self-blame, guilt, sadness, and resentment are a natural result of living with a depressed person. 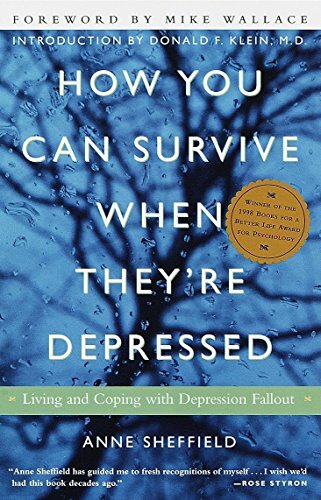 Sheffield brings together many real-life examples from the pioneering support group she attends at Beth Israel Medical Center of how people with depression fallout have learned to cope. From setting boundaries to maintaining an outside social life, she gives practical tactics for handling the challenges and emotional stresses on a day-to-day basis.